I knitted in the round from the bottom up in a lace pattern, decreased accordingly, and when it's almost near the waist line, i knitted straight instead of in the round, going back & forth. When it came to the sleeves, I cast on extra stitches and went up from there, did a few rows of ribbing and then bound off. One thing I love about knitted garments is they have a bit of a stretch, so if you knitted a little too tight or too loose, it's almost impossible to tell. The bodice didn't take very long, but the skirt part took forever! For a first dress, I'm pretty happy with the way it turned out. I really like the yarn I'm using which is Spud and Chloe Fine , a gorgeous wool & silk blend. One skein will probably make 3-4 dresses! I am so pleased with Georgia's new haircut! 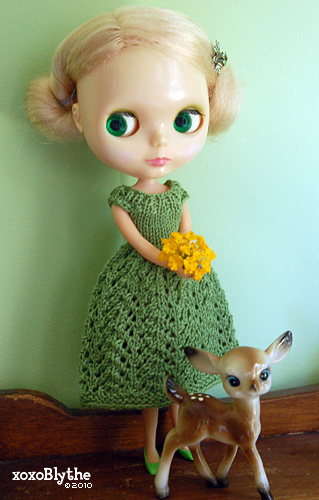 After five years in my family (she arrived in September 2005) I finally decided to do something with her hair. I love the variegated hair color on V-Smash, but because her hair is center-part and she has the SBL head shape, it makes her head look huge! I've seen quite a few V-Smash with bangs/fringe and really love how they look. Those of you who have V-Smash know she has A LOT of hair, and a very thick thatch part. It took me two hours from start to finish, working on one small section at a time. Thanks to Melissa's wonderful tutorial on PuchiCollective, it was very easy to follow. I used a fine-tooth comb, claw hair clips, and clear hair bands. I also used a size 2 bamboo knitting needle to sort out the part and thatch. It's amazing how precise the needle can get to separate thin strands of hair and plugs without having to worry about scratches on the face. I wanted the bangs longer for a more sophisticated and mod look, so I left the initial cut really long and worked my way up slowly with a small sharp scissor, stopping to check the length each time and continue to iron over a wet towel as I progressed. I think I was able to tame the thatched part. Now that Georgia is a little less top-heavy and has a new haircut, she will be photographed a lot more! 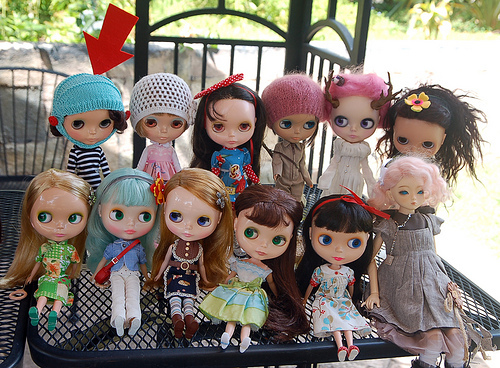 I took five of the xoxoBlythe girls to a Blythe Meet yesterday, in the patio of Aztec Hotel in Monrovia. We had a great time hanging out, chatting and making new friends! My girls are sitting in front - from L-R: Britta (Mondrian), Edith (MSR), Julia (HH), Caitlyn (KB), and Paige (CB/Faux-Goldie). The rest of the girls are from the Fiddy clan. Big thanks to Fiddy for lending me her SD card too! 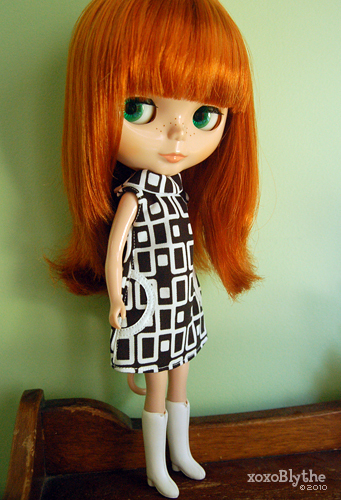 You can see more photos from the May Day Meet in the LA Blythe Meets group on Flickr!